Do you need LTL Carriers service? Contact us today to find out how we can help you! 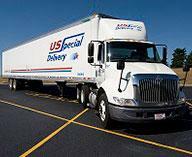 US Special Delivery also provides timely service to the entire US, Canada, and Mexico through a dependable network of partner carriers.